Alex Iwobi has scored with a fine finish to make it England 2-1 Nigeria at Wembley in tonight’s friendly. 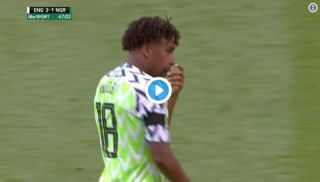 After some poor defending from England, Iwobi pounced with a well-placed finish after Odion Ighalo had hit the woodwork. Arsenal fans are now predictably complaining that they never see Iwobi play this well for them after an impressive outing for his country this evening. Here’s a clip of Iwobi’s goal, and it’s fair to say he needs to be finishing these chances more often if he is to establish himself as a star player at Arsenal.